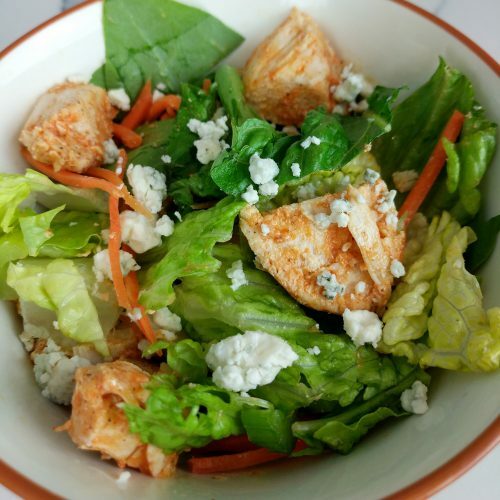 This Buffalo Chicken salad is just what the doctor ordered! It is low fat, low calorie, low carb, high protein and delicious! It is crisp and refreshing and will take you back to game day without all the side guilt! I compared my recipe to restaurant nutrition facts and the results are SHOCKING. I looked up Chili’s Boneless Buffalo Chicken salad and their “healthy” salad has 1030 calories, 72g fat, 47g carbs and protein. GUYS. This is exactly why you need to meal prep!! You would assume because you ordered a salad that you were eating healthy. WRONG. You might as well have eaten a burger! Restaurant meals have a ton of hidden macros. If you aren’t cooking the meal yourself, you have NO IDEA what is going into that meal. All that extra love the restaurant just served you, went straight to your love handles! Meal prep people!! On the flip side my buffalo chicken salad stats are AMAZING. The following is based on a 4 oz serving and can be tailored to your daily protein intake. (I make an 8 oz serving for my husband = dbl the protein). 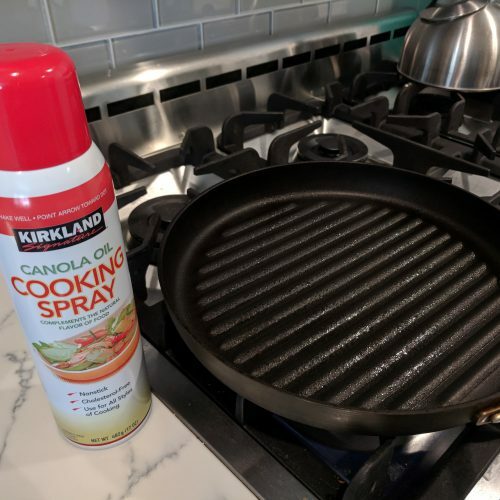 Without dressing, it has 150 calories, 1.5g fat, 5g carbs, 27g protein. 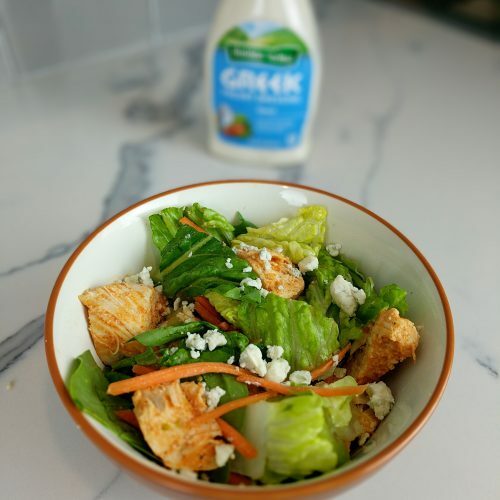 With Hidden Valley Ranch Greek Yogurt dressing it has 210 calories, 6g fat, 8g carbs and 28g of protein. Not too shabby!! I would say that is pretty darn amazing! I make 2 lbs of chicken in advance and then store it in the fridge. 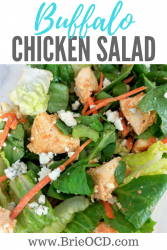 Cooking the chicken takes about 15 minutes but once you do that, this salad takes less than 5 minutes to throw together. PRO TIP: make sure you drain the chicken BEFORE you put on the Frank’s Red Hot. You need to get rid of that excess juice. I buy my carrots already pre-shredded because ain’t nobody got time for that! (photo below). I also like to use two different types of lettuce (Romaine and Spinach) to get the benefits of each. 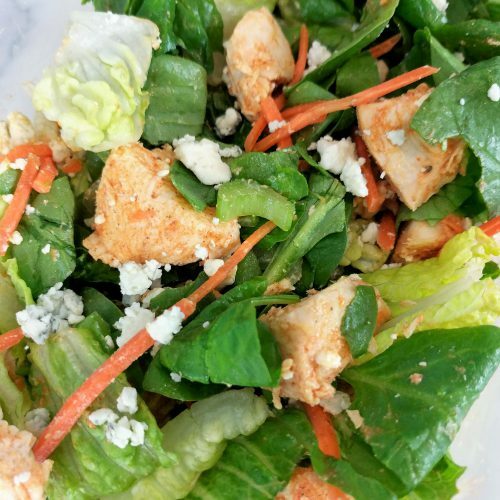 Spinach is jam packed with nutrients, antioxidants and minerals and I like romaine for the crunch and that true buffalo chicken salad feeling. You can find Frank’s Red Hot Wing Sauce in just about any market, however I buy mine at Wal-mart. It is way cheaper there and sometimes they have the manufacturer’s coupons around the neck! I recently got two bottles for 50 cents a piece! SCORE! I buy my dressing at either Sprouts (they sell Walden Farms) or at the market. You can also click any of the products mentioned in this blog and find them on Amazon. I just found Hidden Valley Ranch Greek Yogurt Dressing and its good! (click here to view/buy). However, you can use light or fat free ranch as well or Walden Farms Blue Cheese is also a good option. Some people are afraid of the Walden Farm’s nutrition because it apparently has nothing in it. At the end of the day, use what you like, but be sure to look at the nutrition label and make sure it is low fat and doesn’t have a lot of sugar! 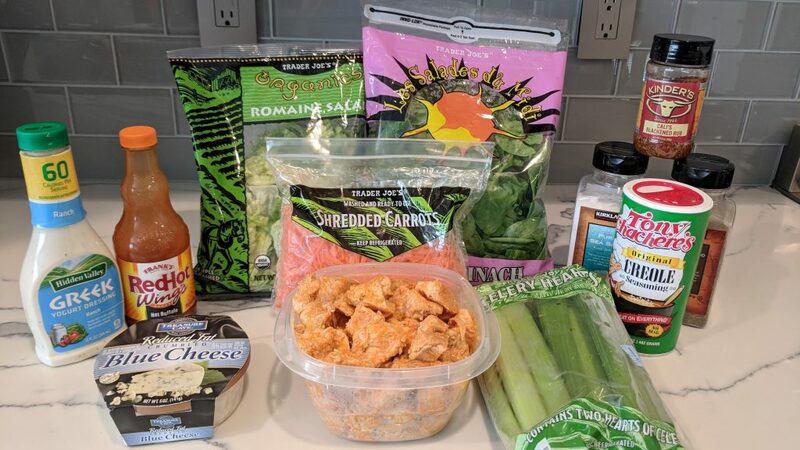 If you like this buffalo chicken salad recipe, check out some of my others…. Buffalo Chicken Bake, Buffalo Chicken Pizza, Buffalo Chicken Stuffed Sweet Potatoes! 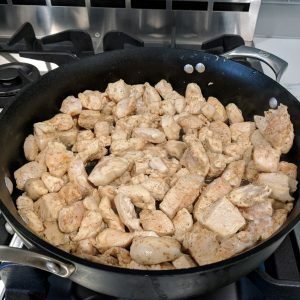 add cubed chicken to pan and lightly season with salt, pepper, creole and blackening seasoning. Stirring occasionally, saute chicken until no longer pink, about 5-7 minutes. DRAIN and leave chicken in the pan. turn heat down to low and add franks red hot wing sauce to chicken. stir until chicken is coated with sauce. get the other components to your salad ready. place both lettuces in a bowl. top with shredded carrots, celery, blue cheese crumbles, and chicken when ready. top with your favorite ranch dressing and enjoy!